We know little of William Scott's origins or early life. 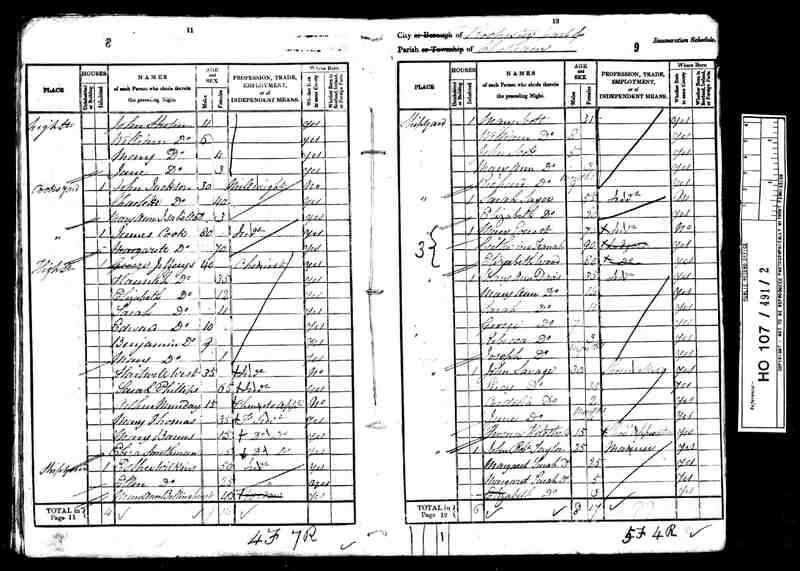 Census records from 1851 and 1861 consistently indicate he was born in Chatham, Kent about 1805. We have no firm knowledge of his parents or siblings. The one comment that has passed down, but which may not relate to ancestors of this William, is that the Scott family had been in Kent for some generations (this comment was from Ronald Scott a great, great grandson, but he could not say how far back this went). Of Mary Hyder we are fortunate to have much more information. Mary was the second of nine children christened by Richard Hyder and his wife Ann(e) at the Church of Saints Peter and Paul, Charing, Kent. The earliest parts of the present church are the chancel and nave build of flint in the early 13th century. the transepts were added in the early 14th century, followed shortly by the vestry. A timber tower was replaced in the 15th century by the stone tower seen today. Mary and her siblings were christened here. Her parents, grandparents and great grandparents are buried here. Charing lies on a line of springs that surface where the porous chalk of the North Downs lies above impervious clay. The earliest evidence of human habitation is an Iron age flint working, and there was a Roman villa in the vicinity. The name Charing is thought to derive from that of a local Jutish chief, 'Ceorra', pronounced Cheorra. Charing was given to the Church of Canterbury by Egbert II, King of Kent between 765-780, and the manor remained the property of the archbishops until Henry VIII took it from Archbishop Cranmer in 1545. The land below the Downs has always been a major transport route. An Iron Age track at the top of the Downs was supplicated by another at the foot which became incorporated into the Pilgrims' Way, the route to Canterbury described in Chaucer. Charing, today is a small rural town on the A20 about two thirds of the way between Maidstone and Ashford. Mary's father, Richard, like his father and grandfather before him, was a carpenter. Beyond Mary's christening entry we have no documented records of William and Mary until 1832 when the Banns for the marriage of William Scott and Mary Hyder were read on three consecutive Sundays in June of 1832, on the 3rd, the 10th and the 17th at the Church of St. Mary Magdalen in Gillingham. They were then married at the church on Wednesday the 20th. as recorded in the marriage register of the church. While apparently a rather uninteresting document, we can obtain some interesting information and further questions from it. We see that William is a bachelor and Mary a spinster. This implies that neither had been married before. The church did not record the ages of parties to a marriage at that time, but we know from later records that William would have been about twenty seven and Mary twenty two years of age. By these ages William had probably been working for about fifteen years. A sailor (at least he was in the following year at the time of the christening of their first son), he might well have gone to sea as a boy sailor at an age as early as twelve (as did his son William about 1845). He might also have traveled fairly extensively. At the same time, he would have come to maritime service no earlier than about 1817, a year pr more after the Napoleonic wars, a time when military naval expenditures were much reduced as as result of the peace. He may therefore have had to take a variety of jobs to keep employed -- a pattern which we see in his later married years. Later census entries indicate that he was born in Chatham. It is possible that his father was a military person and there is a family rumour that an ancestor in the Scott line, likely his father, was at Waterloo. At this time we cannot be sure, but perhaps further information will appear. Mary, at 22 would likewise have been working for probably ten years. She was one of the older of many children and it may be that she spent some of these years in Charing looking after younger siblings. At the same time she may have left the family parish and home to be in Chatham. She was certainly there long enough to have been courted and won by William. The marriage record states that they are both of 'this' parish which probably meant that Mary was living and working in Chatham (although we do not know at what -- it is not clear why the wedding would not have been in her home parish of Charing -- perhaps further research will give us information on this). The document is interesting in providing use with samples of the handwriting of William and Mary. This means they both were sufficiently literate to write their names in a cursive script and both hands are fairly 'flowing' which indicates some competency in writing. The two witnesses were, John Fox(?) and D. Benstedy(?). John was not literate as indicated by the 'x' beside his name and the comment underneath. The other witness was. We do not know who these people were. This is almost all that we have on the marriage. Except, many years later, in the mid 1960's, Lillian [Scott] [Fry] Simmons wrote " . . Iris to have China Cabinet Spode Plate Rivited Square Bread & Butter Plates Part of a Wedding Present Set to my Great Grandmother William Scotts wife in (1828) . . " Lillian died in 1967 and wrote the comments in the early 1960's -- she did not have the documentary evidence we have of the wedding and it is forgivable that she would be off by a few years in indicating the year of marriage. Mourning card for William and his second wife Sarah who predeceased him by about 2 weeks. Birth certificate provided by Philip Griffiths. As we accumulate the various birth certificates for these children we will gradually gain more information on what happened with the family in these years. These documents also allow us to start to trace the career of William. At present we see that William was a sailor in Woolwich in 1833, living at Paradise Hill. In 1836 he listed his employment as a painter. At the time of Mary Ann's birth in 1838 he lists himself as a mariner. We do not know yet of his activities between 1838 and 1851. Nor have we yet attempted to trace his experience as a sailor. 1. William the oldest son, would traditionally have been named after his father; but it might also have been after his grandfather -- we may be looking for a William Scott born about 1780 as the father of William, born 1805. 2. John, the second son was named after whom? Again it might have been his paternal grandfather and so maybe we are looking for a John Scott born about 1780. The 'Thomas', and his initial trade as a carpenter came from his maternal grandfather. 3. Mary Ann's mother and maternal grandmother were named Mary. Was her paternal grandmother named Ann? She did have an Aunt Ann on the Hyder side. 4. We can now see that Richard's name came from his maternal grandfather which gives strength to the assumption that his paternal grandfather's name was John. 5. George is a Hyder name and was the name of a great uncle of the George shown here. 6. Eliza is a name we find on census returns and in the executor's notes for Mary Ann's estate. It may well be that her name was Elizabeth and that she was named after her Aunt Elizabeth Ann Hyder. 7. We have similar questions with respect to Emma -- we have no knowledge of what happened to her. I wonder if she changed her name to Ellen and is the Ellen Whitcher, mother of Ellen Whitcher, cousin of Walter Scott, William Scott's son? We have not yet located an entry for William who was apparently not home at the time of this census. We see the four eldest children listed. It is possible that there have been other children who did not survive, but we have no positive information on that. Britain started a major expansion of its prison facilities in the late 1840's, including the building of a number of new prisons. Persons with military experience were well positioned to take employment in the Convict Service as warders. (We cannot at this time be sure that William sailed with the navy, but his location at Chatham and Woolwich which were major naval bases, strongly suggests that). Financially, the opportunity was attractive. An assistant warder might earn twice as much as a sailor (as we see from studying the life of his son William). In addition the employment was steady, not from ship assignment to ship assignment as it was in the navy at that time. This was enough to bring William into the service. We see that by 1851 he has moved the family from the Woolwich area to Portsmouth and has become a prison warder there. The 1851 census return does not include the oldest son William but from other sources we know that he was a sailor at this time.It is interesting that William also apparently later arranged for at least three of his sons to become warders. William moved from Portsmouth to Woking Prison where he is located on the 1861 census. This move might well have been in conjunction with the opening of Woking in 1859. We were fortunate in knowing of this move from a note left by his granddaughter Lillian Scott (mentioned above). The census entry is from Woking, Surrey. The address of the residence at the time of the census was 110 Government Buildings -- these buildings were later re-named, but at this time had just been occupied and bore the government building designation. It is interesting to note that the only children still living at home are Eliza and Emma, however a grandson, John Scott (son of John Thomas Scott and Martha Jacobs) was staying with them at the time of the census. William is listed as being a prison warder. However, ten years later in 1871, he does not appear there, while his son Richard is on staff at Woking at that time. The 1871 census finds Mary a widow living at 78 Stamford St. in Portsmouth. Her occupation is described as a "mangling woman"; this was a woman who put clothes through a wringer (mangler) in a laundry. The life of the children will be dealt with in other documents. It does however appear that the family was fairly close. William and John married sisters Mary and Martha Jacobs on separate occasions in 1856 and William Sr. was a witness at John's wedding. John's son, John was with his grandparents in Woking in 1861 at the time of the census, and was living with his widowed grandmother in 1871 at age 13. Woking and Portsmouth were not far apart and the rail line between Portsmouth and London, which passes through Woking, had been completed in 1845. Mary Ann was married sometime before 1865 and bore a son. Mary Ann was a photographer's assistant and it is undoubtedly with thanks to her that we are fortunate enough to have photographs of William and Mary, probably taken around 1860. It is an interesting exercise to attempt to date the photographs. In doing so we recall that the first daguerreotype was made in 1839. By 1850 photographs on paper started to become common in England (in the U.S. the technology moved in the direction of tintypes). The photograph of Mary was taken in Portsmouth at the studio of W.V. Amey, 253 Commercial Rd. We have a number of photographs taken there and it is likely that this is the studio in which the daughter Mary Ann worked. 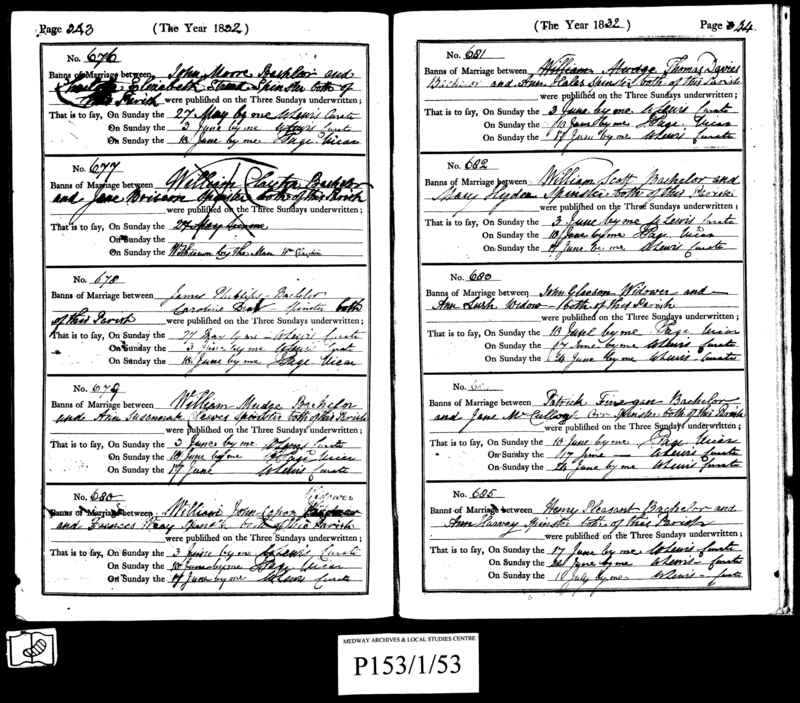 In 1851 the family was in Portsmouth and Mary Ann is listed as being 'at home' in the census record. She had probably finished her schooling by this time (10 year old Richard was a 'scholar; while 14 year old John was an apprentice carpenter) and she may well have started in a shop within a year or two. This could indicate that Mary's photo might have been made about 1855 when she was about 45 years old, an estimate that I think is consistent with her image. William Scott's photograph is a little more 'stilted' and appears, in quality, to have been taken a bit before this. His hair does not show a preponderance of gray coloration. It may well be that it was taken about 1850, and maybe even a couple of years earlier, just at the start of the explosion in photography. At this time he would have been about 45 also. We have some other photographs of persons identified only as cousins of William, the son. Are these on the Scott side or Hyder side? We have little information on the final years of William and Mary. We can conclude that William died before 1871 when Mary lists herself as a widow. It is likely that a death registered in Q3 1870 in Portsmouth for a William Scott age 64 (from FreeBMD) is that of our William Scott. However we do not know if he died before retiring, or if he retired. He might have been working as a warder again at Portsmouth prison or he might have retired and moved to Portsmouth with his wife and daughter Eliza. By 1881 we find that Mary is living in Portsmouth. She has moved from 78 Stamford St. to 74 Stamford St. during the past 10 years. She shares a house with two of her daughters, Mary Ann (Cole) and Eliza who has not yet married. Mary Scott is living on a pension. The daughter, Eliza appears to not have an income source. Also living with them is George Cole, Mary Ann's son. Mary Ann, like her mother, is listed as a widow. Just across the water on the Isle of Wight we Mary Hyder Scott's two sons, William and John who are both working at Parkhurst Prison. In 1883 her son William will retire and move back to Portsmouth, so that is she is still alive and he is nearby. The entry for Mary who is now 80 years old is a bit confusing. The entry shows initially that she is living on her own means (i.e. a pensioner or annuitant as shown in 1881) but that has been crossed out and replaced by the occupation of beer retailer. Additionally, although she has in all previous census returns indicated her birthplace as Charing, Kent, she is now indicating it is in Kew, Middlesex. These answers may well be a bit of mischievous behavior on her part, or, alternatively, may indicate a degree of senility. Again we see the daughter Eliza living with her. Eliza is now 45 years old and in all census entries we have seen so far she is living with her parents and has no occupation. It is possible that she was unemployable for some reason, but no information seems to have been passed down in the family about this. We also find that the daughter Mary Ann Cole is part of the household, however Mary Ann's son George is no longer with them. 3. See if we can trace the 'missing' children, George and Emma. I have a suspicion that Emma may have adopted the name Ellen and married an Alfred Witcher. 4 We have the times of the deaths of William and Mary but need yet to get their death registration certificates. This document is 'in progress'. Any errors are mine. Contributions to this account of William and Mary's lives would be much appreciated.